There has never been a book that has helped children to understand politics in a more clear and entertaining way - nor has there been a more necessary time to do so. this is a simple and intelligent introduction to the murky world of political ideas. it is also by reading the likes of Politics for Beginners that children from national school level upwards can begin to gain insights into the nature of how and by whom societies are governed. So many young people are getting interested and involved in politics and this accessibly illustrated book helps children as young as 9 understand more about this complex world. The perfect title for young inquisitive minds. Essential reading for children aged nine and above and would be particularly useful for any parent, teacher, librarian etc. who has ever been asked about those sensitive issues that they may find difficult to discuss with those ever-curious youngsters. A brilliant resource for all ages, this book explores the big issues in both the political world today & political systems throughout history. The colourful and appealing style of this brilliant book explains and covers key topics such as different types of government and ideologies, human rights and freedom of speech. Politics can be confusing – but this brilliant book makes even complex concepts and issues easy to understand. An exciting and informative book helping children understand everyday politics. Highly informative and very accessible. 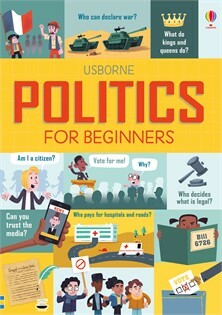 Politics for Beginners is ideal for both children and adults, and is guaranteed to win the vote of anyone looking for a no-nonsense, easy-to-understand guide to what politics is all about. This entertaining book does an admirable job of explaining politics to the young, clarifying structures, principles and issues, showing different views of controversial subjects, and enlivening the coloured pages with cartoons without diluting its substance. Relating policies to everyday experiences, it encourages engagement, and is inclusive in both its images and its attitudes. Informed by experts, it embraces the history of political systems (including ancient democracies, feudalism and absolute monarchies), and is an excellent trigger for debate. It also has a section on “how to argue”, which would make Twitter a much better place if everyone paid attention, including “don’t be personal”, “back up your opinions with facts” and “be prepared to change your mind”. Before I started reading this book I wasn't too sure about it, because I don't really know anything about politics. As I started reading I was amazed at how interesting it is and I really like it. There are loads of fascinating facts and pictures in it. This book tells you what a democracy is and how it works, who is in charge of the country, what politics are, and what a government is. I didn't know about any of these things, but now I do! Great book I found with easy to read and great help to my homework too. Very interesting book that gives a good understanding of politics ideas. This book is brilliant, really helpful with History and Citizenship at school. Its really easy to read and I have learnt lots of new information. This is one I will keep going back to. Who says Politics is boring! What a great book, easy to read through. Its layout makes it appealing to children and its explanations are clear and interesting. I read it with my daughter (8) and learnt things myself! If you want to find out about the fundamentals of politics, then this is the book for you. It gives you a basic outline of how decisions are made and who has power in the UK and across the globe. Chapters explore different subjects such as what democracy is, elections and voting, political change and much more. Despite the fact I loved them all, one of my favourites was ‘Is there such thing as human rights’ since it tells you how human rights started. I found this fascinating because it made me question whether all humans are treated equally, given there is so much war, famine and poverty in this world. After reading this book, I realised how important democracy and politics are and without it the world would be in chaos. I particularly related to the piece on Nationalism as I am half Irish and half Greek but hold a British passport. So I feel proud to have all three nationalities. I recommend this book for children aged 10 and over and I think it is a really excellent introduction into Politics. The sort of book I wish I had growing up. I studied politics at A-level and have loved the subject since I was little so this book is something I wish I’d had back when I first got into current affairs and politics! a comprehensive and engaging introduction to the political system. Easy to understand guide to politics for adults and children. In today’s world of fake news and increased complexity of issues, it’s good to feel that children have a grasp of the basics - and so much is covered here from the basis of democracy, human rights, voting and elections, to the right to protest, capitalism and war. Politics for beginners is great fun, but weighty too! Well researched, engagingly written... and we love its cartoony illustrations. The text never gets bogged down by even the trickiest of explanations, and yet never feels glib or frothy. This is the kind of book that would be accessible to a 10 year old, and yet would be useful and engaging to anyone wishing to gain an introduction to the central principles of politics. I've just given a copy to my 17 year old, who's thinking of going to uni to study history and politics. He particularly likes the section entitled "How to argue"! It is easy to look through and very appealing to the eye. I learnt about different terminology and political techniques. Madeleine received this book and set about reading it straight away, it made her feel very grown up as she felt it was a grown up topic. She particularly enjoyed the more history of politics books and she enjoyed looking at the illustrations. Before I started reading this book I wasn't too sure about it, because I don't really know anything about politics. As I started reading I was amazed at how interesting it is and I really like it. [...] This book tells you what a democracy is and how it works, who is in charge of the country, what politics are, and what a government is. I didn't know about any of these things, but now I do! This is a great introduction to politics for children. I read this with my 7 year old and she was happy just dipping in and out of different chapters. As she gets older I am sure it will be a great springboard for her/us to do further/deeper research. Really interesting book that gives a good understanding of politics including the history of different political ideas. Fantastic Book! I really enjoyed reading this book, for it explained politics in a simple, easy to understand, fun way. I especially liked the pages with all the arrows where it told you if you were socialist or capitalist etc. [...] I definitely recommend to any History student, old or young, as well as anybody interested in Politics or how the world works. On the blog: Democracy, elections, voting – how to explain politics to children?